Like “The Walk," “Freeheld” is based on an Oscar-winning documentary. The 2007 film of the same name told the true story of terminally ill Laurel Hester, a veteran Ocean County, New Jersey police department detective who fought to leave her pension to her domestic partner Stacie Andree. I have not seen Cynthia Wade’s documentary short, but I’ll assume it is free of the stereotypical message-movie dramatic license and characterizations that ultimately sink its well-acted fictional re-enactment. It feels uncomfortable to criticize a film with such noble intentions, and it’s even more disheartening when you share that film’s beliefs and politics. But “Freeheld” stumbles over too many hurdles to recommend it. The film’s heart is in the right place, but its focus is not. Screenwriter Ron Nyswaner (“Philadelphia”) commits the sins that aggravate me most about films like this. Rather than give us a richly drawn romantic couple, with whom an audience can identify because they too have been In love, he gives us stick figure stand-ins for the film’s endorsed issue. “Freeheld” then introduces another stand-in for the hearts and minds it wishes to change, and then spends way too much time with that person. The couple fighting for their rights is then pushed even further from our embrace by an endless series of scenes that take place in a political chamber. It’s the "Star Wars: The Phantom Menace” of message movies: we want action, but we get Senate hearings instead. Freeholder hearings is more like it. The Ocean County freeholders stand in the way of what rightfully belongs to Hester and her partner. The film doesn’t mention their political affiliation, but you don’t need to be Albert Einstein to figure it out. 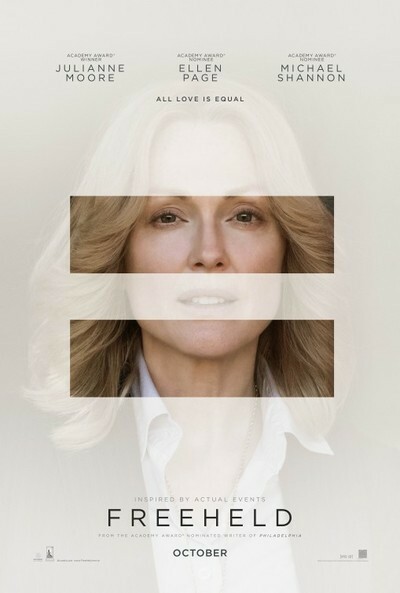 In 2005, when “Freeheld” takes place, New Jersey law allowed people in domestic partnerships to pass on their pensions to their significant others. The law also allowed counties to opt out of such activities. It’s unclear whether the politicians object to Hester because of “the sanctity of marriage” or some compulsive need to not only demand a unanimous vote, but to never reverse any prior vote’s outcome. This latter point is repeated enough times to muddy the waters, especially when one freeholder wants to side with Hester, but doesn’t so as not to break the streak of unanimous votes. Before we get to the villains, “Freeheld” gives us a little time to experience the relationship between Laurel (Julianne Moore) and the far younger Stacie (Ellen Page). These early scenes have a lot of unfulfilled promise. Laurel, who is closeted at work, leaves Ocean County to find a mate. She and Stacie hit it off, and there’s some amusing comedy in how Stacie discovers Laurel’s profession. There’s also a nice scene of triumphant one-upmanship at Stacie’s mechanic job interview; the man she bests in a tire-rotation challenge seems more irritated that a woman beat him than he is about her orientation. We also meet Laurel’s longtime cop partner, Dane (Michael Shannon), the aforementioned audience stand-in. Dane has harbored a crush on Laurel for quite some time, and he’s genuinely hurt when he discovers she’s been keeping her sexuality a secret from him. Dane gets more screen time with Laurel, and in general, than Stacie does. It’s his job to convince his colleagues—and the viewer—to support Laurel and Stacie’s plight. Once committed to each other legally, the Hesters buy the house that will become the central focus of their challenge against Ocean County’s stubborn elected officials. They barely have enough time to savor domestic bliss before Laurel becomes deathly ill with cancer. To the film’s credit, it doesn’t harp on scenes of Laurel suffering. Unfortunately, this is also when “Freeheld” puts the couple’s relationship on the back burner. A litany of central casting character tropes come out of the woodwork to speechify and signify. There’s the uber-Joisey sounding homophobic cop, the terrified closeted gay male cop who acts against his own interests out of fear, the evil military dudebros who threaten Stacie at her garage, the priest who speaks on behalf of Jesus in the film’s most embarrassing pander, and the activist who takes up the couple’s cause as a means of furthering his own gay marriage agenda. The activist, Steven Goldstein, is played in outlandish comic fashion by Steve Carrell. Carrell’s portrayal isn’t offensive, but it feels more like performance art than a fleshed-out character. I didn’t buy a single one of the “sweethearts” and “honeys” he uses to punctuate his speech, but I did enjoy how he used them as weapons against the unenlightened. He provides the much-needed jolt movies like this need, and he also provides a key observation I wish the film had explored. Whenever he mentions marriage to Laurel, she stresses the word “equality” instead. Steven sees them as the same thing, but it appears Laurel does not. I wanted a deeper dive into these logistics, but “Freeheld” has more clichés to evoke instead. The talented actors do their best to flesh out their meager roles. Page has an endearing swagger that’s almost James Dean-like, Moore’s toughness hints at her underlying vulnerability, and Shannon convincingly navigates the moment his internal conflict gives way to understanding and activism. Carrell commandeers every scene in which he appears. They’re all undermined by director Peter Sollett’s flat direction. The film is shockingly bland to look at, and with all its far too familiar scenes of clichéd conflict resolution, it plays like an after school Special. Still, you may weep by the end, and I will fully endorse your tears. However, “Freeheld” left me a bit annoyed. Hester’s story is compelling without the dramatic embellishments and audience hand-holding. I was haunted more by the pictures of the real couple displayed during the closing credits than anything I saw in this movie. So I asked myself why do minority and LGBT-related issues always require the often unsatisfying "Guess Who’s Coming to Dinner?” treatment? Haven’t we grown as an audience to be able to accept more complex portrayals? Sadly, the answer is probably no. “Freeheld” isn’t a terrible movie, but it’s an unsatisfyingly familiar one.